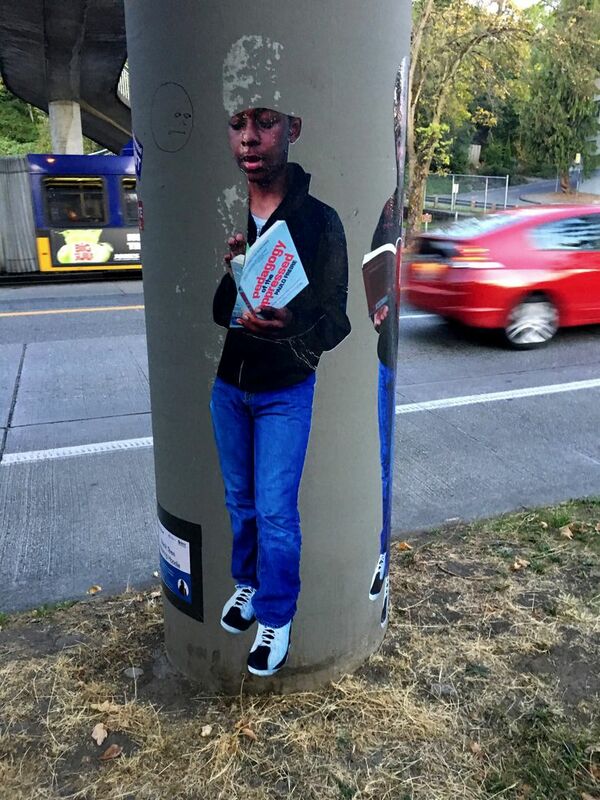 The defacement and removal of “Black Teen Wearing Hoodie” artworks in Capitol Hill and West Seattle say a lot about the way society views young African-American men, but also about how we should respond to racism. All he’s doing is reading a book. 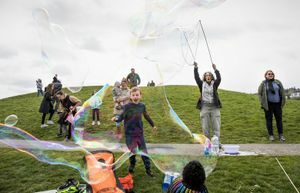 Jasmine Iona Brown repeats that sentence like a plea when we talk about what vandals in the Capitol Hill and West Seattle neighborhoods did to publicly displayed portraits of her 14-year-old son Jaymin this summer. The life-size portraits are part of Brown’s socially conscious series titled “Black Teen Wearing Hoodie,” a reference to the hoodie worn by the African-American teen Trayvon Martin when he was fatally shot by a self-appointed neighborhood watchman in 2012. Martin’s killing gave rise to the Black Lives Matter movement. 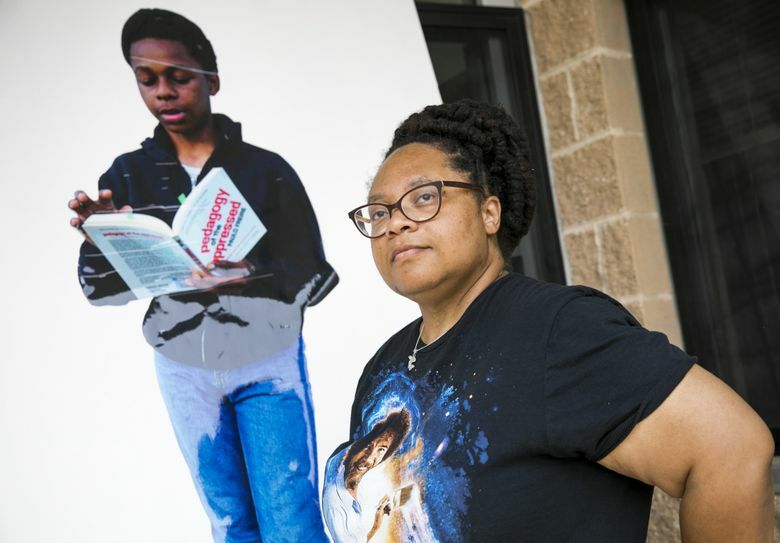 With help from Photographic Center Northwest, Brown, an African-American artist and schoolteacher who lives in Tacoma, displayed a photographic decal depicting her son reading a book on an exterior wall outside the center’s Black Panthers exhibit in June. Someone tore off the head. To send a defiant message, the center, located on 12th Avenue across from Seattle University, replaced the portrait and even enlisted support from Capitol Hill businesses along 12th that agreed to display decals of Jaymin on their exterior walls, too. The replacement and some of the artworks fixed at other locations were ripped down as well, in one case multiple times. Two of four decals Brown had installed in public places in West Seattle also were mutilated. Vandals cut off the portrait’s arm and part of Jaymin’s Afro on one. Everything but his sneakers was cut off on the another, with graffiti making it look like he’d been devoured. Brown discovered the damage while giving an art-walk tour. “There’s 30 people with me, and I’m standing in front of the pieces that had been destroyed,” she says. Art can force us to face ugly truths we’d rather turn away from. What to make of its destruction? When I spoke to Jaymin, he said he’s not letting the incidents get to him, and that he’s not surprised that public art would become a target, even though he’s depicted doing everyday things like reading and playing guitar and saxophone. Jaymin’s just a kid, a soon-to-be high-school freshman who’s been in a youth band called the Sax Muffins and enjoys competitive wrestling. Then again, Jaymin’s not just any kid. Brown, 45, has fought to give Jaymin the tools he needs — academic and emotional — to be successful in a world that can be hostile to young African Americans like him. She moved from Indiana to the Seattle area in 2010, partly to escape the Midwest’s more overt racism. She recalls KKK marches in full regalia in her home state of Indiana. Brown knows hate when she sees it. Still, I couldn’t help feeling that while the vandals failed to take Jaymin’s innocence, they’d succeeded at chipping away at some of his mother’s. The fact that it happened in two predominantly white but progressive Seattle neighborhoods opened Brown’s eyes. 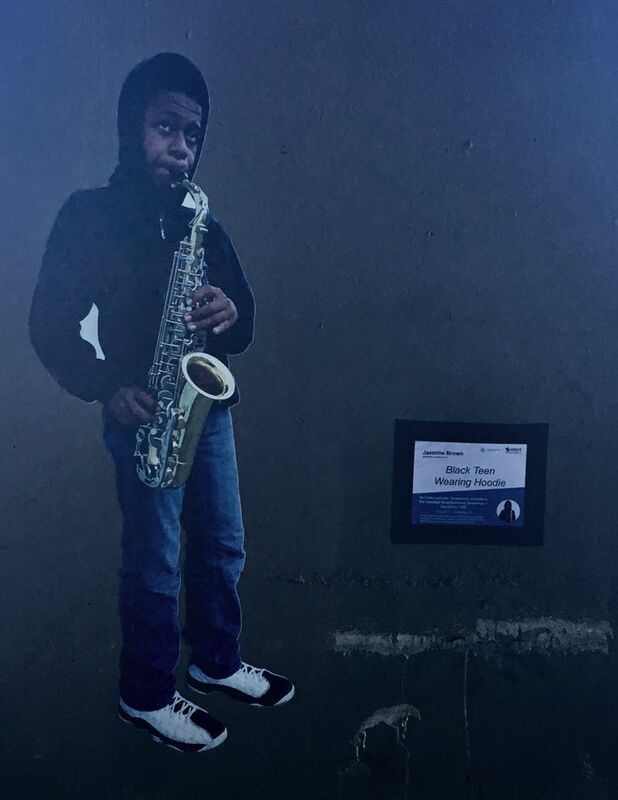 A Jaymin portrait she displayed in Tacoma, in an area with more people of color than Capitol Hill or West Seattle, has been left alone. The book Jaymin’s posing with in that first portrait is “Pedagogy of the Oppressed,” which among other things rejects traditional teaching approaches as damaging to marginalized people. “Our kids are going into classrooms with folks that often don’t necessarily understand our ways of communicating or being in the world, and consider things that we do disrespectful or hostile,” Brown tells me. Brown, who teaches photography, design and technology in Tacoma, intended to take us to school, to use her portraits to correct stereotypes about young black men. Instead, she learned lessons of her own. It’s unclear who’s behind the vandalism. But if this is how people respond to harmless pictures of her son, Brown wonders, how does that bode for Jaymin himself? “It makes me afraid for him as he goes out into the world, how he’s going to be received, how the world’s gonna view him,” she says. Photographic Center Northwest and other supporters did a laudable thing by continuing to replace Brown’s damaged portraits. We should keep Brown’s concerns for the real Jaymin ringing in our ears. Tyrone Beason writes a social-justice column for The Seattle Times. Reach him at tbeason@seattletimes.com or on Twitter @tyrone_beason.